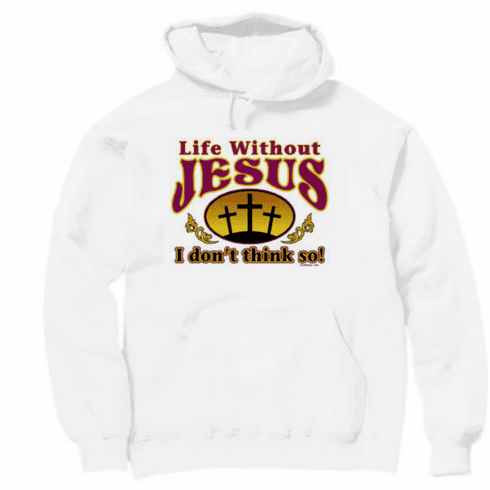 Christian pullover hoodie sweatshirt: Life without Jesus - I don't think so! Home/Our HoneVille.com Store/Christian Designs /Christian Designs page 2 /Christian Shirt: Life without Jesus - I don't think so!/Christian pullover hoodie sweatshirt: Life without Jesus - I don't think so! Home/Our HoneVille.com Store/Christian Designs /Christian Designs Page 3 /Christian Designs page 4 /Christian Designs page 2 /Christian Shirt: Life without Jesus - I don't think so!/Christian pullover hoodie sweatshirt: Life without Jesus - I don't think so! Home/Our HoneVille.com Store/Christian Designs /Christian Designs page 4 /Christian Designs page 2 /Christian Shirt: Life without Jesus - I don't think so!/Christian pullover hoodie sweatshirt: Life without Jesus - I don't think so!